Growing up in Michigan, Heidi discovered her passion for riding at the age of eleven. She began her equestrian journey as a jumper, but soon became aware of the exciting world of Dressage. Heidi continued her love of horses while attending Michigan State University where she received her degree in Animal Science with a Pre-vet option and equine emphasis, while also serving as Vice President of the Michigan State Equestrian Team. After earning her degree she moved to Florida to further her dressage career. In 2004 she relocated to Germany where she successfully showed and trained under the tutelage of Olympic Gold Medalist Hubertus Schmidt. TRAINING: Now located full time in Loxahatchee FL, just minutes outside of Wellington, Heidi is accepting horses for full training and consignment. She is known to be able to ride “Anything” and ride it well! She has trained several horses from the very beginning to successful FEI horses and has scored over 70% internationally. Heidi trains her horses with the classical and systematical methods that have proven successful over generations. SALES: Heidi makes it her business to find the best horses for the best price. Her extensive experience both nationally and internationally has provided her with a keen eye in selecting a horse with top movement and potential. 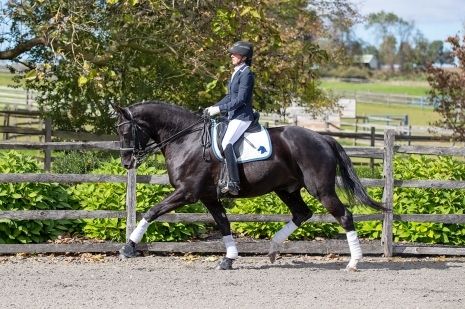 Heidi understands the standards which determine a quality dressage horse and is your connection to the adult amateur, young rider, or professional horse for Dressage. Heidi is available for teaching, will travel to clinics, and looks forward to finding your next Winning Dressage Dream Horse! Amateur Safe, 2010 Hanoverian Gelding Schooling all 4th Level.